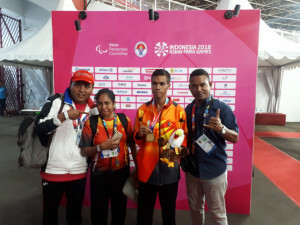 The Timorese athletes Teófilo Freitas and Pascoela dos Santos Pereira, respectively won gold and bronze medals in the third edition of the Asian Para Games. Teófilo Freitas won the first gold medal ever for Timor-Leste on October 12 in the 400-meter T37 class with a time of 53.14 seconds, setting the Asian record by breaking the previous record of 53.44 seconds. Before winning the gold medal, Timor-Leste had already won the bronze medal on October 10 with Pascoela dos Santos Pereira beating a Korean athlete 3-0 in table tennis. The Asian Para Games are held in Jakarta, Indonesia, from 6 to 13 October, where three thousand athletes from 43 countries compete in 18 different modalities.